Prevent client apps from bypassing the enforcement of your conditional access policies. This article explains, how you can address both cases. Some cloud apps also support legacy authentication protocols. This applies, for example, to SharePoint Online and Exchange Online. When a client app can use a legacy authentication protocol to access a cloud app, Azure AD cannot enforce a conditional access policy on this access attempt. To prevent a client app from bypassing the enforcement of policies, you should check whether it is possible to only enable modern authentication on the affected cloud apps. In addition to modern authentication, SharePoint Online also supports legacy authentication protocols. 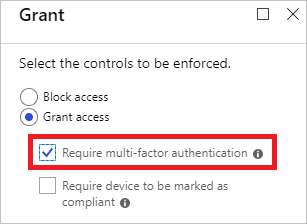 If the legacy authentication protocols are enabled, your conditional access policies for SharePoint are not enforced for clients that don't use modern authentication. 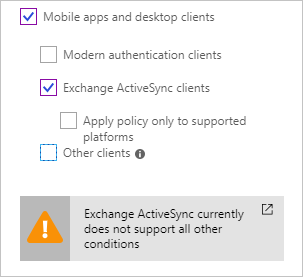 When selecting Exchange Active Sync clients in your policy, you can't configure other conditions. a. 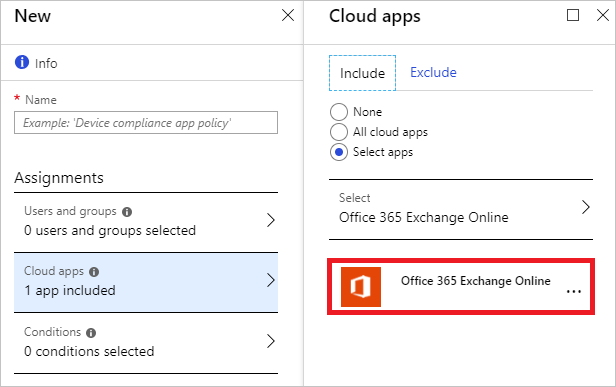 Select just Office 365 Exchange Online as cloud app. b. Select Exchange Active Sync as client app. Block Exchange ActiveSync by using Active Directory Federation Services (AD FS) rules. @RuleName = "Block Exchange ActiveSync"
In addition to modern authentication, Exchange Online also supports legacy authentication protocols. 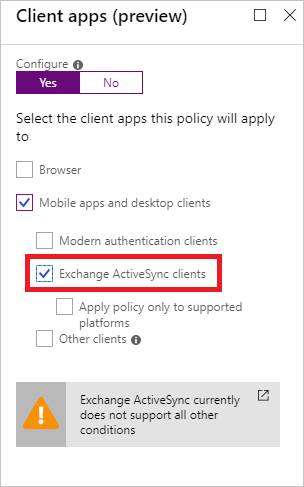 If legacy authentication protocols are enabled, your conditional access policies for Exchange Online are not enforced for clients that don't use modern authentication. You can use the following issuance authorization rules to enable or block traffic at the AD FS level. @RuleName = "Allow all intranet traffic"
@RuleName = "Allow Exchange ActiveSync"
@RuleName = "Allow extranet browser and browser dialog traffic"
@RuleName = "Allow all intranet traffic only for browser and modern authentication clients"
For more information, see What is conditional access in Azure Active Directory. For instructions about configuring claim rules, see Configure Claim Rules.